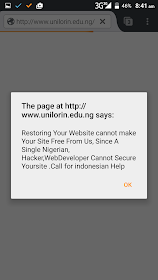 The University of Ilorin Website which was initially hacked some months ago by unknown hackers -has been attacked again Indonesian Hacker or Group of Hackers called “GhostHacker”. A warning statement which is similar to that posed earlier by the initial Nigerian Hacker has been re-iterated again by the Ghost Hackers which is “Patch Your Bug. Fix Your Site Problem. The page reads; "Restoring your site cannot make it free from us, since a single Nigerian Hacker or Web developer cannot secure your site, call for indonesian help".